Use the Employee Overtime Authorization Form to approve overtime hours for an employee or contractor. Proposal Kit, Contract Pack, and Proposal Wizard yesterday and have created what I believe is an AWESOME proposal! We will see if I land the consultancy! I will keep ya posted." This Employee Overtime Authorization Form is included in editable Word format that can be customized in Word or by using the included Wizard software. Employee: First Last Job title of signator, authorized signature or signer. Contract Job Title Department: Department Supervisor: Supervisor Overtime Period: Start Date to End Date. All employees must obtain written permission from a supervisor in order for overtime pay to be credited. Employees must complete the following form and file it with the Human Resources Department prior to working any overtime. Estimated Overtime Hours Reason Date. 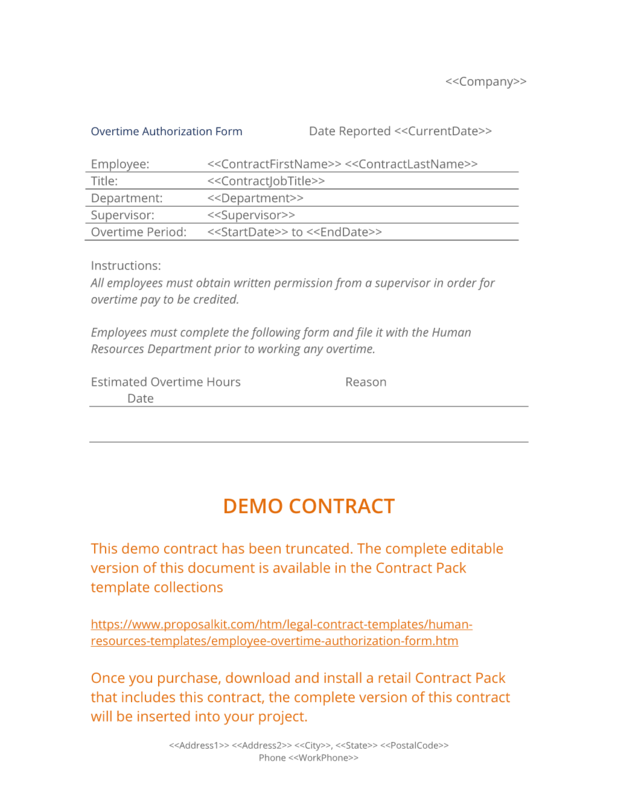 The complete Employee Overtime Authorization Form - with the actual formatting and layout - is available in this Contract Pack.